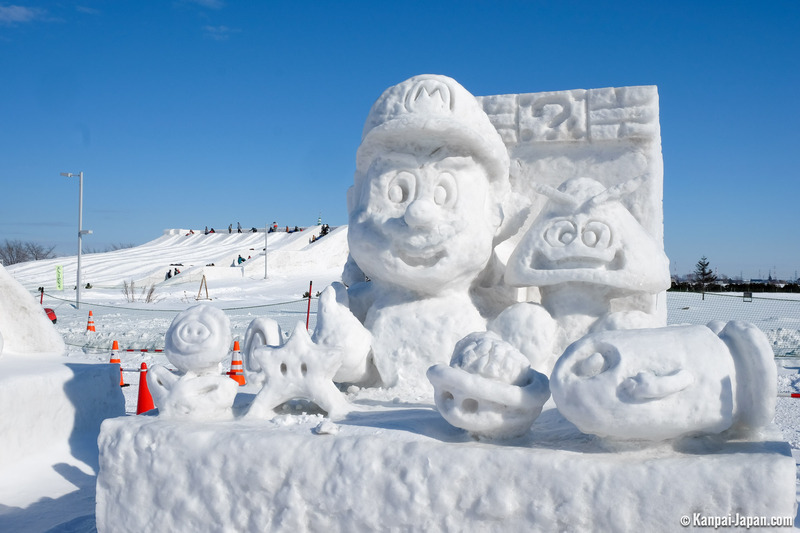 Yaki Matsuri is the Japanese name of the snow festival that occurs every year in Sapporo, the capital city of Hokkaido Island in northern Japan. 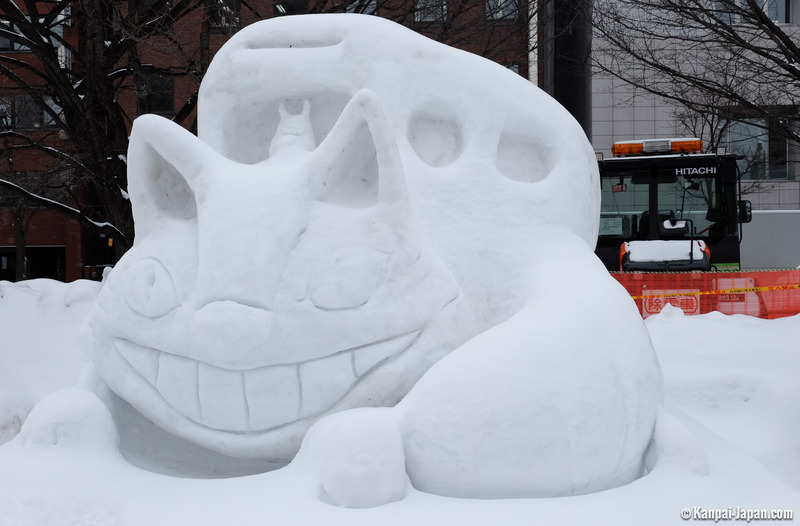 For seven days in February, a large number of visitors travel to Sapporo to admire the two hundred snow sculptures and ephemeral statues displayed in the city's several districts. 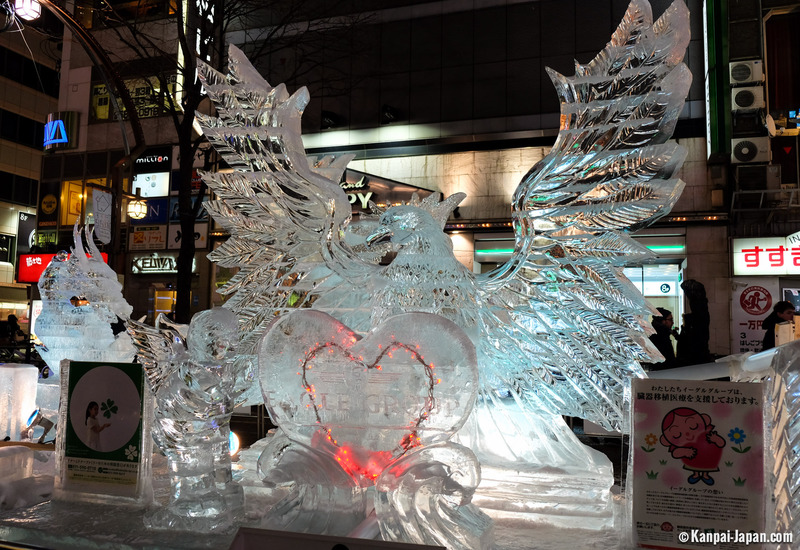 The beginning of February marks the most important part of the year in Sapporo. 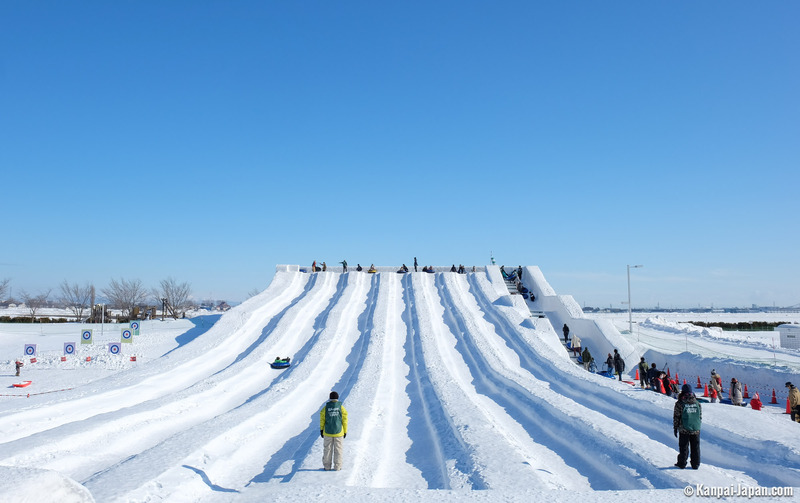 In the heart of winter, several thousand local amateurs and foreign professionals combine their efforts and creativity to build around two hundred fifty statues of snow and ice. 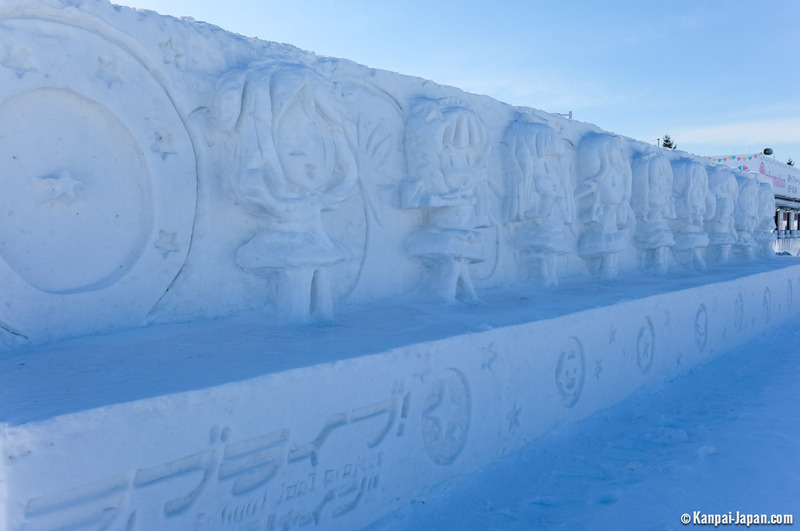 For a week, the city lives at the pace of the tourists wandering the festival's diverse sites day and night to admire the duplication of famous monuments and characters in ice. Unlike the majority of festivals, this modern event is not so traditional, so there is no link to religion. 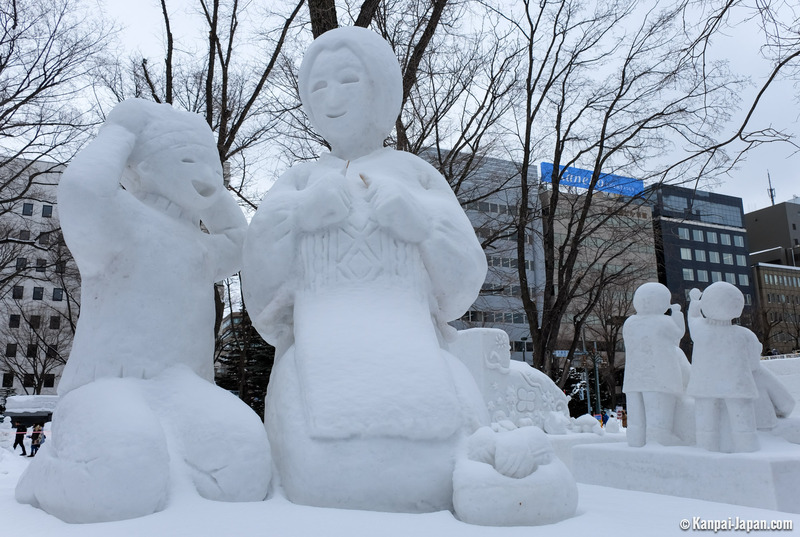 Its origin dates to 1950, when students in Sapporo built six snow statues and displayed them is the city center at Odori Park. They received a warm welcome from the population and decided to do it again the following year. Thus, the idea of a recurring event was born. 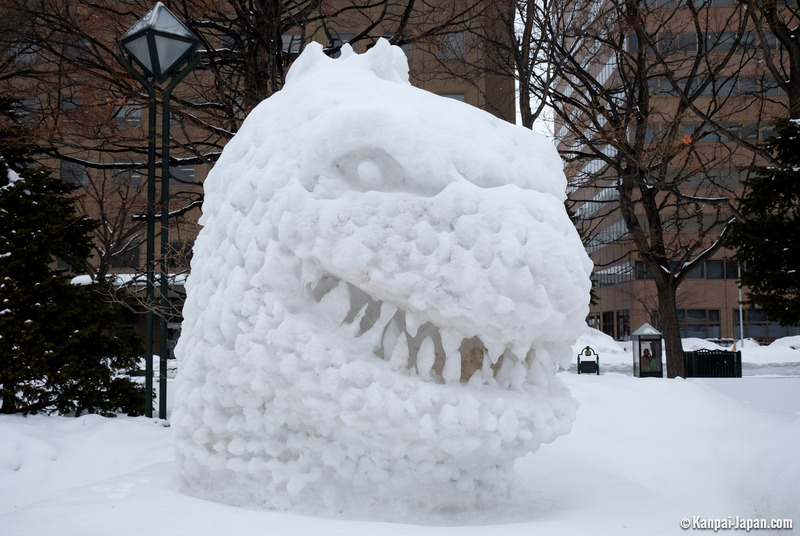 In 1955, the gathering became larger when the Japan Self Defense Force (JSDF) decided to take part and built huge sculptures. 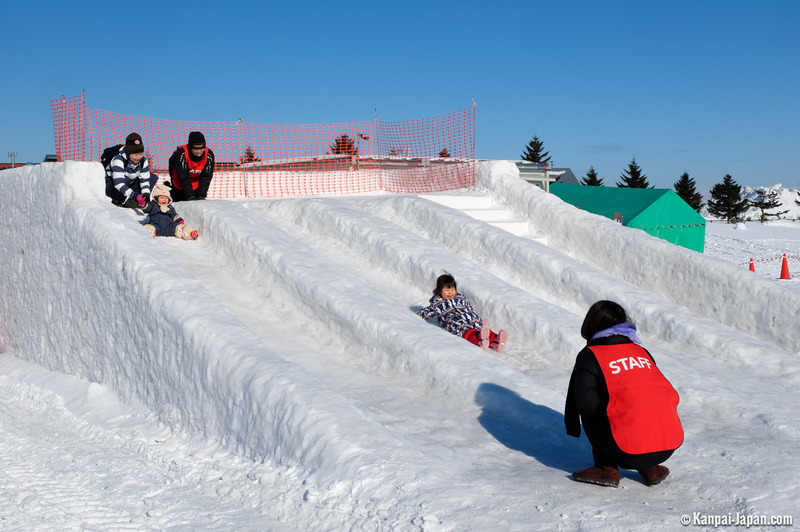 Already loved by Japanese people, the festival gained global legitimacy during the Winter Olympic Games of Sapporo in 1972. 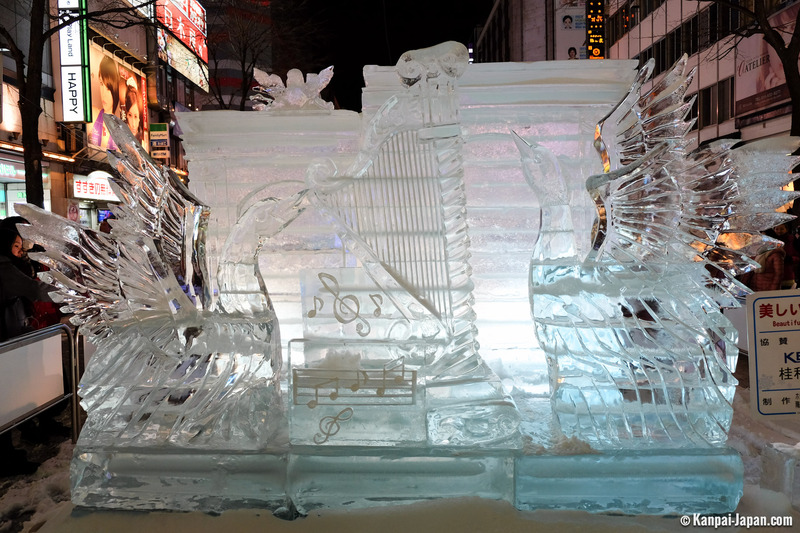 An international ice sculpture championship was launched in 1974. Ever since, visitors have been able to admire teams from several nations working live on their statues over several days. Tourism statistics increase annually: more than two millions people now visit the festival each year. 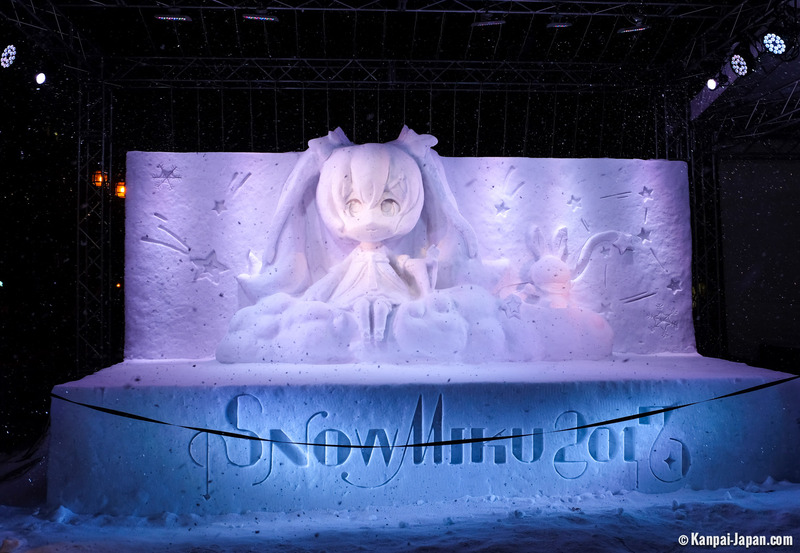 Unfortunately, its great reputation also disappoints regular visitors, who have seen a decrease in the quality of the snow statues. 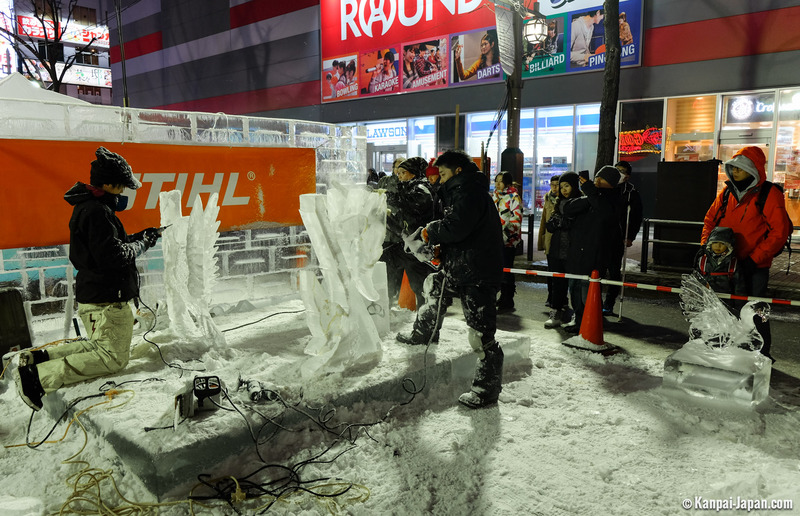 Now, videos and lighting are largely highlighted instead of the art of the ice sculptures. Moreover, the festival’s alleys are filled with people mostly at sunset. 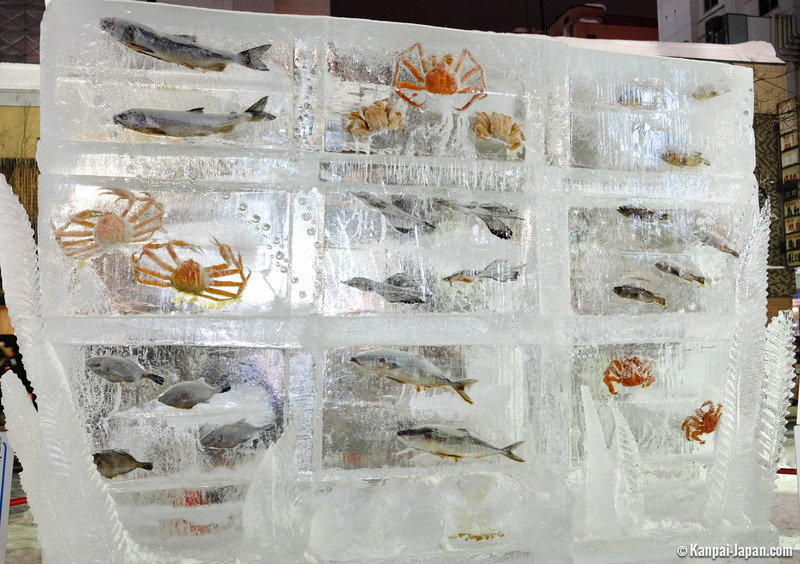 Currently, the Yuki Matsuri occurs accross three sites. The second original site, Makomanai was closed in 2005 after forty years of operation. 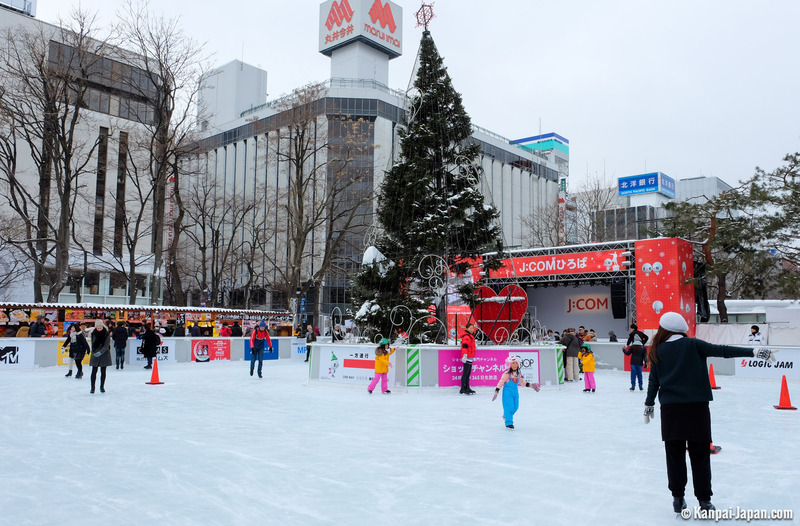 This is the main site of the festival, located in the heart of Sapporo and easily accessible from the main train station by metro. 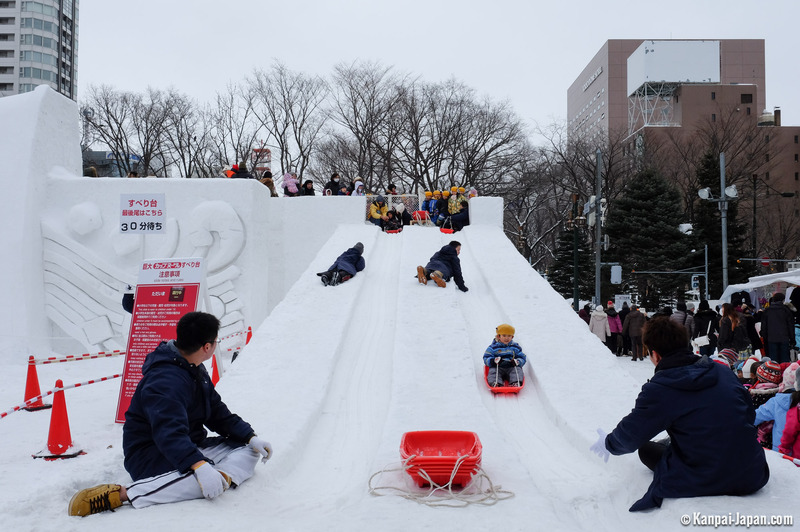 The long avenues of Odori Park welcome the biggest snow and ice statues, as well as numerous other attractions, such as an ice-skating rink, a jumping rail for snowboarders, and numerous delicious local food stands. 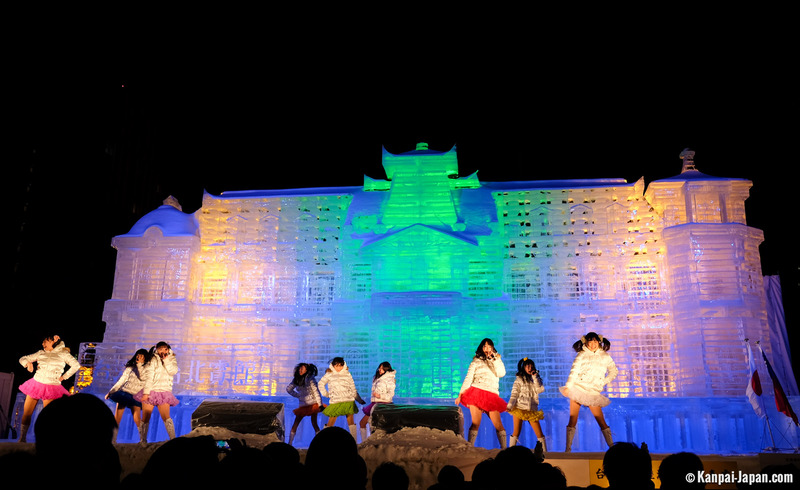 The winter illuminations dress the sculptures in magnificence, bringing them to life during light and sound shows. It is recommended to climb to the top of the Sapporo TV Tower located close by to enjoy a nightime view of the site below. The characters Cloud (from the back) and Sephiroth from the video game Final Fantasy VII. 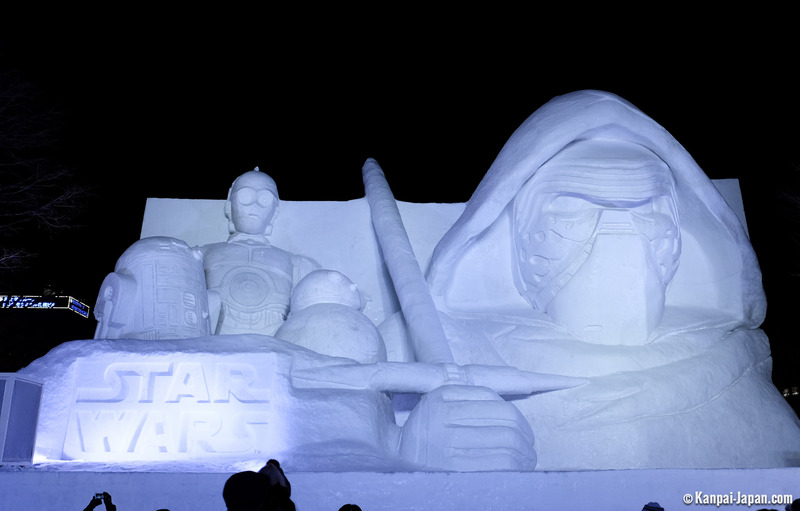 Star Wars, in tribute of the 40 anniversary of the fourth episode. Georges Lucas’ saga has featured in previous editions of the matsuri. 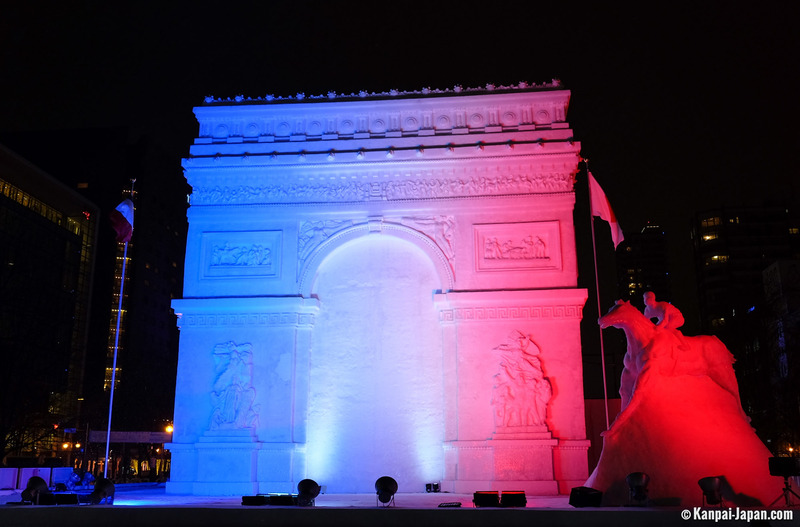 The Arc de Triomphe of Paris, realized at a 1/3 scale by the JSDF, accompanied by a thoroughbred horse, related to the famous eponymous race, more popular with Japanese people than it is with the French people! The main building of Kofuku-ji Temple in Nara. Totto Shotengai, a shopping arcade dedicated to Tetsuko Kuroyanagi, a famous Japanese TV star. Taipei Guest House in Taiwan, renowned for its architecture. The Whale House, chosen and imagined by pupils of Hokkaido’s elementary schools. 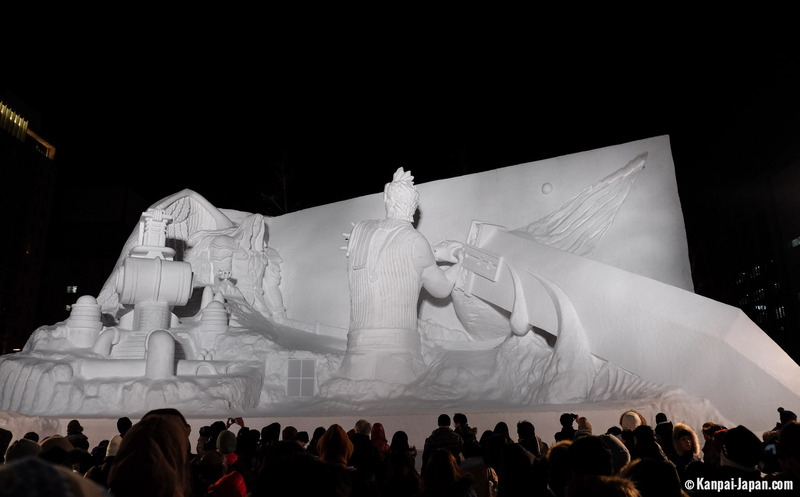 A 15-meter piece of art from Final Fantasy. A tribute for the 90th birthday anniversary of mangaka Osamu Tezuka, with Astro Boy, Black Jack and Princess Sapphire. In 2019, the festival will celebrate its 70th anniversary. 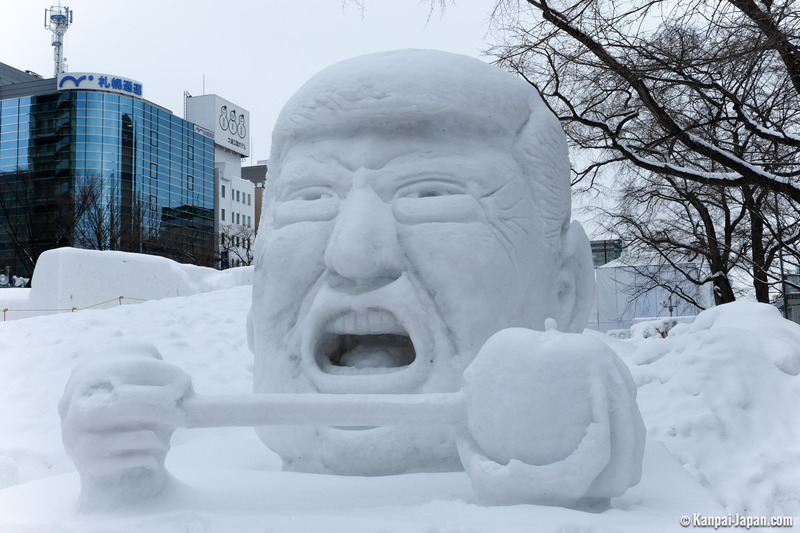 Odori Park is also home to fifteen statues competing for the international championship, as well as hundreds of pieces more humble but just as interesting as the others, made by the inhabitants of Sapporo. Visitors can also vote with their smartphones to choose the best amateur pieces. 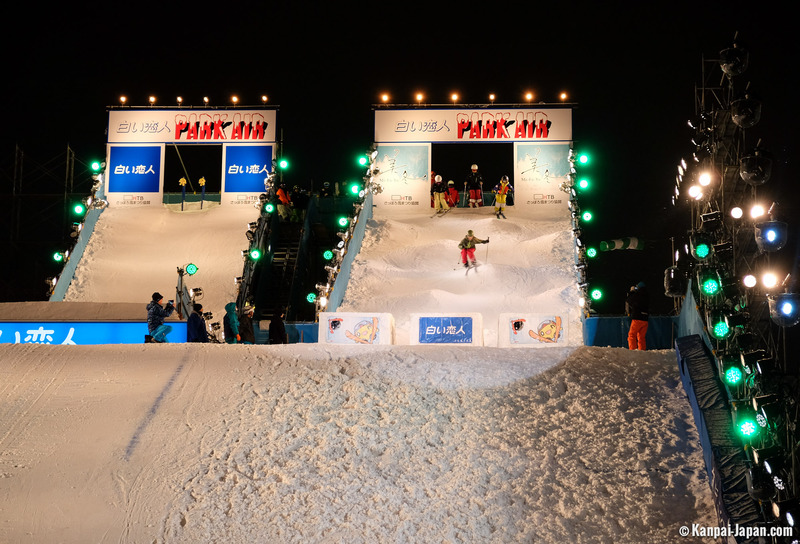 Chosen in 1983 to host the festival, Susukino is, before all else, the entertainment district of Sapporo, made up of restaurants and bars open until late into the night. 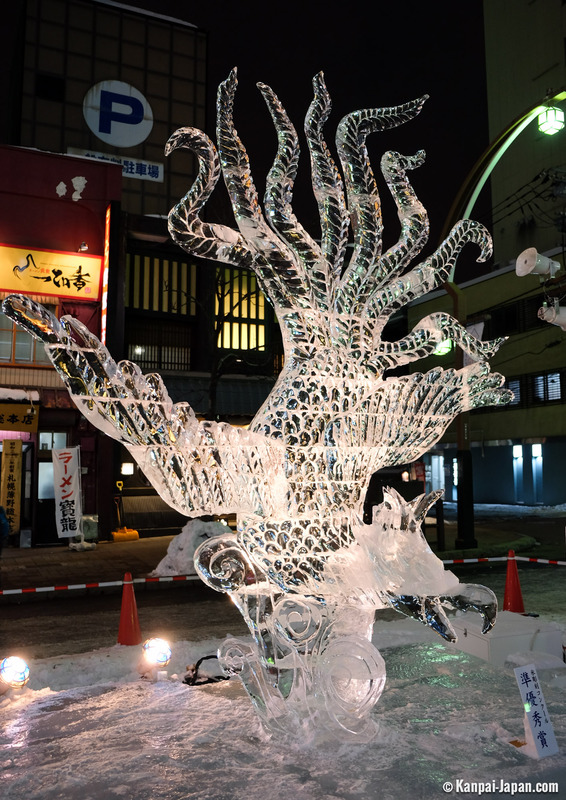 About sixty ice statues of diverse size and height stand along the main avenue. Sponsored by brands, these pieces tend to offer a large part to marketing and communication rather than to their aesthetic value. The most recent place to join the festival in 2009, Tsudome is a little outside the center compared to the two other sites. 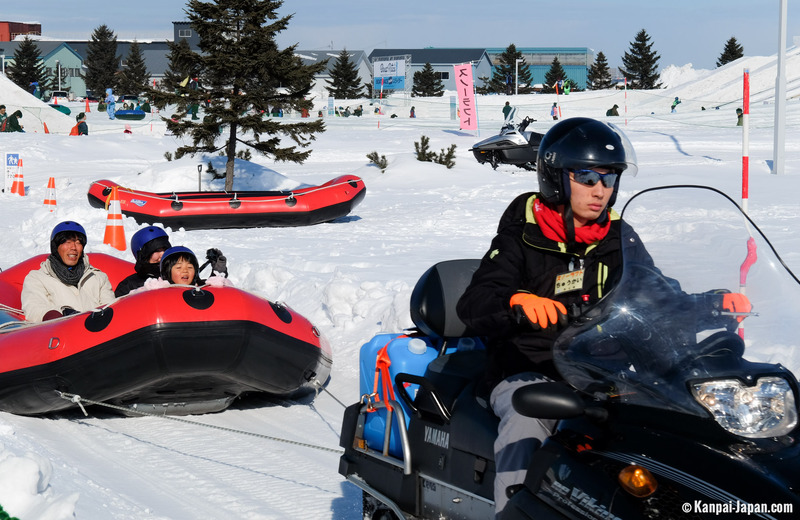 It is the best location for families and children, coming to try the diverse ice hobbies, as it always exudes a warm, happy atmosphere. 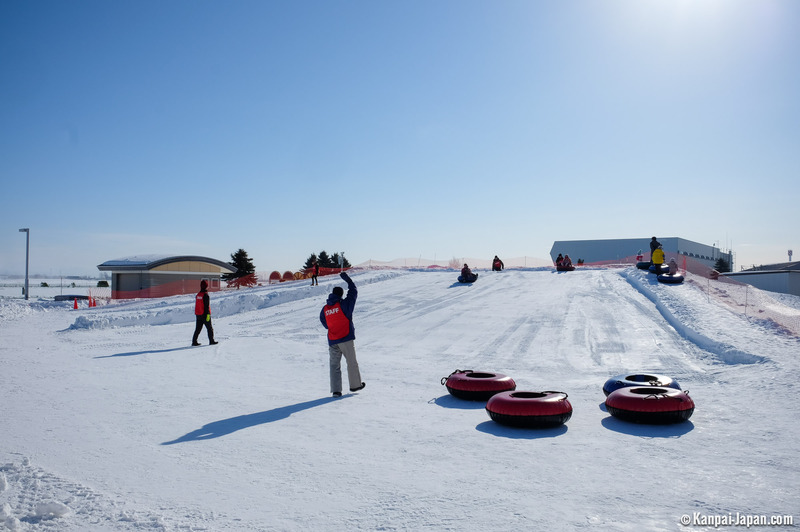 On the menu: ice slides, rafting on snow, luge slopes, a white maze, and golf. 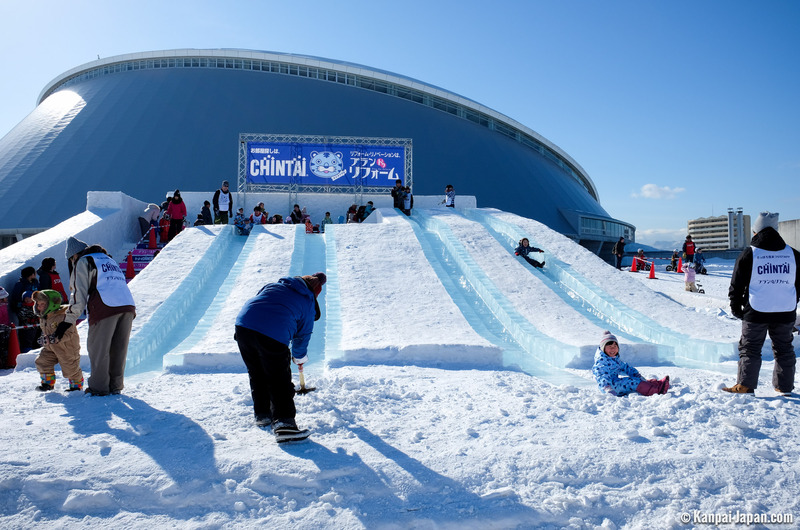 A whole day there is recommended to fully enjoy Tsudome's charms. 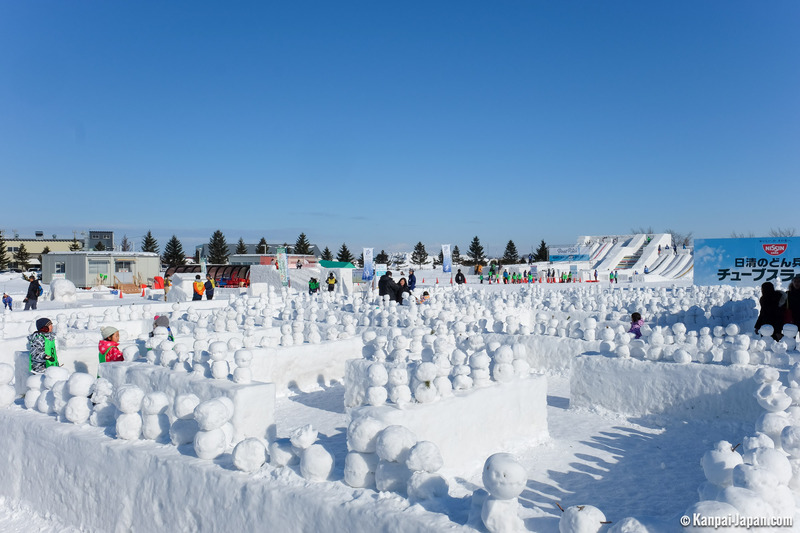 Snowman-building championships, among other activities, also take place, as do snowball battles. Culinary events also happen under the big dome. For those willing to escape the crowd, it is interesting to stay one more day to witness the statues' destruction, which happens immediately after the end of the matsuri. 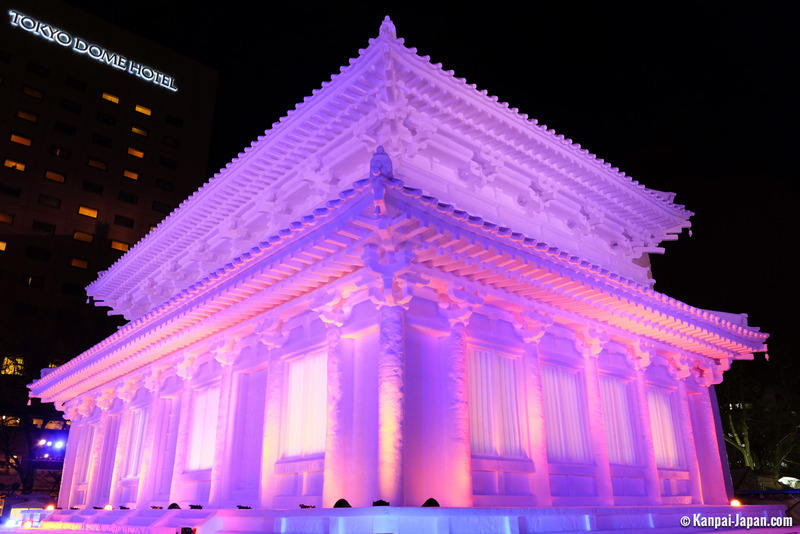 Odori Park: light-up until 10 p.m.
Tsudome Site: open from 9 a.m. to 5 p.m.